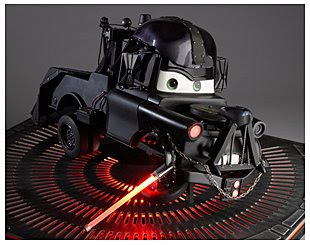 My Darth Mater went up for auction at the Dream Halloween charity in Los Angeles...well, technically, Santa Monica. Yep, that is the real original Batmobile from the Batman TV series form 1966. Anyway, here is a picture of some dork with Darth Mater. You can see the size of it...if you know how big I am. Along with about 15 other pieces, the item was auctioned off. Uh...the one on the right won the auction, the one on the left has no money. It just happen that he is the President of Mattel's Boy's Division, so sorta like my boss. I wonder if he knows who I am or what I do for the company. Before I left, I got a picture of one of the coolest people you will ever meet. A huge TV star for the past 20 years, and still does not look a day over 10 years old...Bart Simpson. 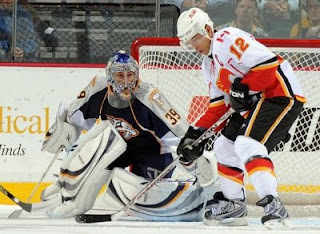 Calgary Flames captain Jarome Iginla scores 3 goals to help the Flames to a 5-3 win over the Nashville Predators.